Re: Lots of rain yesterday! Wow, looks like rafting time in Santa Elena Canyon! Awesome that will help in catching the annual rainfall levels up. Nice! I've been trying to get out there and it's just not happening. Just got off a two day Santa Elena and the river was pretty big. Of course, so was the mud! We've seen a lot of rain in the region, with the majority around Presidio and OJ (3-7"!). 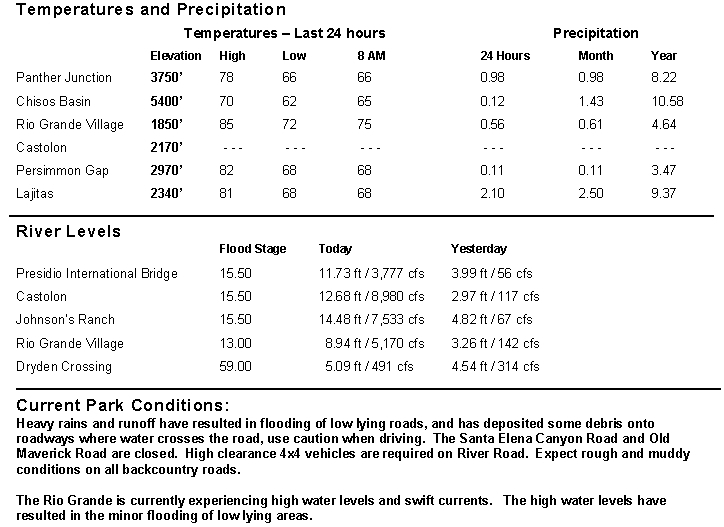 Bofecillos Road should be avoided completely and Casa Piedra is probably impassable where it crosses Alamito Creek. The road to Sauceda Ranger Station at BBRSP is closed to all but high cleance 4x4 vehicles. The Luis Leon is at 80% and more rain is expected. Be careful out there and make sure and call in for updates before you travel!